Well its true, the season is slowly coming to an end and what a year it was. Without a doubt a few things to look back on were the wind and the chinook. April, May and June the NW winds never seemed to cease and this made the Hump and Thrasher Rock chinook fishery hard to access. Luckily for those of us who did not get our fix at Thrasher, we were able to get a good dose of amazing chinook fishing in the back end of July, all of August and right through September off the S Arm and N Arm of the Fraser. It was an amazing year for that fishery and one that won’t be soon forgotten. The Cap was fairly average this year, but it didn’t seem to bother us as much as we were running down to the S Arm all of September and by then we pretty much had our fill of chinook. We also had excellent winter chinook fishing last year, so we are looking forward to December and the New Year to see if that trend continues. In the meantime, there are a few chinook off the Cap, but for the most part the fishery has slowed down this past week. We have had good fishing up until Oct 24th on some years, but most anglers are now starting to focus on the rivers. We have also heard of a few coho and some chums and the odd late chinook off the S Arm, but again most anglers are now focusing their efforts on the rivers. We might get out for a day or two this week off the Cap for a few hours, but after that it is maintenance time and then we will start poking around for winter chinook around the third week of December. It was a great season! Here is one of our favourite pics from the year. 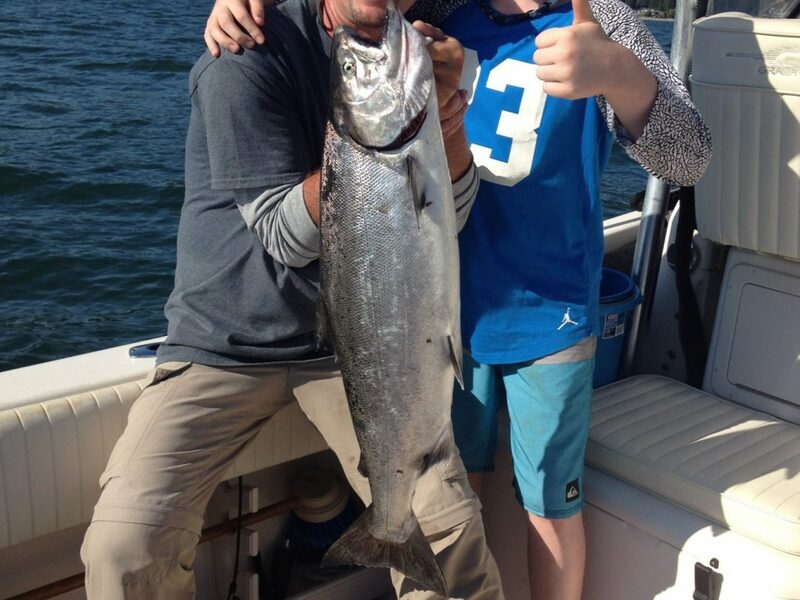 Alex with a nice chinook landed on a earlier this season! A big thank you to all of our amazing customers that booked charters this year and all the local anglers that frequent the shop for their saltwater tackle. We had a fantastic year for charters and the shop way very busy as well. It has been a lot of fun getting to know all of you more and more each year and we look forward to another great season in 2016.